Recently my bed and breakfast, Alaskan Frontier Gardens, B&B hosted guests from Mexico City. They were here in Alaska on their honeymoon, staying for a week. There were two things they wanted to see while they were here: Mt. McKinley and the Northern Lights. The Northern Lights can appear in a variety of forms such as arcs or drapes of light. Colors range from red to yellow to green to purple all of which can appear to dance across the sky. Aurora Lights displays peak in the Spring and Fall, but are also seen on dark winter nights. You just stand in wonder watching the show of lights…mostly seen in the wee hours of the night. One of the Anchorage B&B Association Travel Partners , Salmon Berry Travel and Tours, was very helpful in trying to get my guests to Talkeetna to see Mt. McKinley. They went over the top. They even came by the B&B and explained why they were not going to see the mountain. The weather was the problem in both the tours. Salmon Berry will help you with dog sledding, a trip down Turnagain via the Seward Highway, wildlife tours, and Northern Lights tour overnighting in Talkeetna. They go over the top with true Alaskan hospitality which is a great way to welcome visitors. 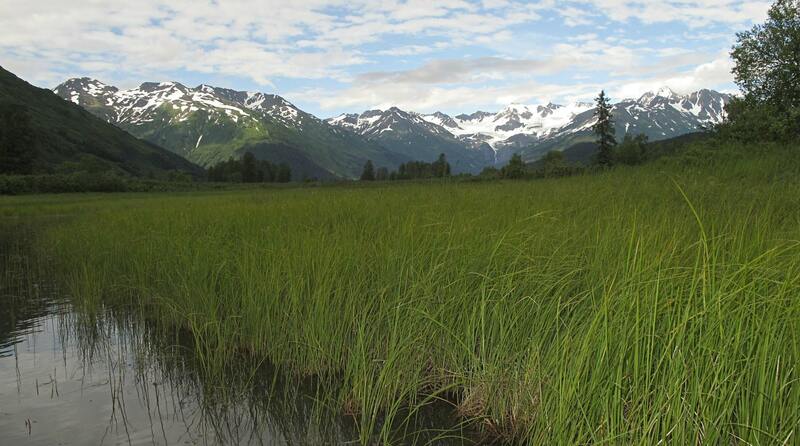 Salmon Berry tours is fully customizable to make your Alaskan adventure dream come true. My guests really enjoyed the beauty, peacefulness, color, and hospitality of Alaska. They were disappointed in not seeing snow, but got to have a chance to see glaciers up close and personal. That’s the true beauty of Alaska!